The concept of preserving the family legacy isn't new to us. After all, that's how we got our start in this business. So when the opportunity arrived to do the same for someone else, we seized it, and this beautifully modernized Land Cruiser is the result! This particular FJ40 was delivered to us in raw form, from Austin, Texas. Owned by a single family over the course of a few generations, and you could tell it hadn't been driven in years — some areas were heavily rusted. Nonetheless, we were up to the challenge of getting this Land Cruiser back on the road again, and looking better than ever. When we began this project our client had a single request: "We want to drive it!" But we wanted more than that, we wanted them to love it again. So, we equipped this beast with the Toyota 1FZ engine with electronic fuel injection, mated to a 5-speed manual transmission. Old Man Emu suspension, power steering, and front disc brakes give the driver more control and more confidence in a wide range of conditions. 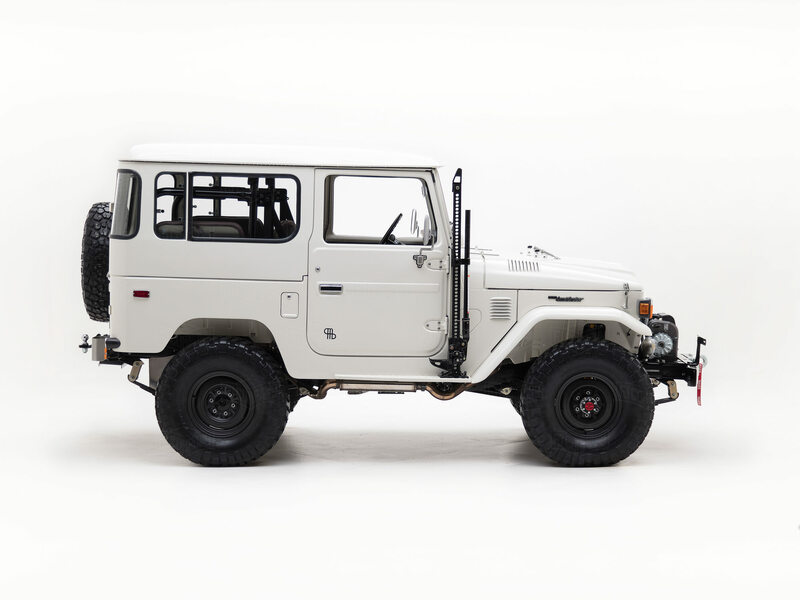 One look at this FJ40 and you know that this is the real deal. The original steel body, rounded front grille, and 80's-style mirrors are all signs of an icon. However, this Land Cruiser has more than its share of custom touches. Off-road enthusiasts will appreciate all of the exterior hardware which includes a Warn® 8274 winch and Hi-Lift® jack. 33” BF Goodrich® Mud-Terrain tires beautifully complement the custom paint job, and each side door bears the symbol of the family that has owned this FJ40 from day one — a personal touch that will be admired by future generations. Inside you'll find a rugged oasis of classic and custom features. The original seats and door panels are trimmed in custom brown leather, and we added a coat of Raptor Liner to the floors to prevent scuffs and rusting. To keep the dash looking clean, we integrated the JL Audio® digital receiver into the stock center console and finished the dash with a custom dash-pad. This premium system includes two JL Audio® speakers flush-mounted to the kick panels, an integrated subwoofer, and a JL Audio® amplifier concealed inside the glove box.